How many people actually know what condition France was in when they surrendered? @Bird on a Rock, it's not me being defensive or anything like that. I like French jokes as much as the next guy, but I was ignorant for a long time and wanted to know if it is common knowledge at this point. @ThePandaPool , didnt they have a few ships left and when they allies requested they destroy them the french refused? So the allies bombed the ships instead so nazi germany couldnt use them. @ThePandaPool , I'm glad you brought it up, though. It's good to stay informed. Is it sad that this is the most reliable news source I know of? @GunLovingMerican, that one I dont know about. @Empshok, that's a tough one, but I'm going with yes. @GunLovingMerican, I do know a French warship sought safe port in Britain but was warned to turn away. When they refused the British gunned them down and sunk the ship along with all the men aboard. And this was after the French saved Britain at Dunkirk. 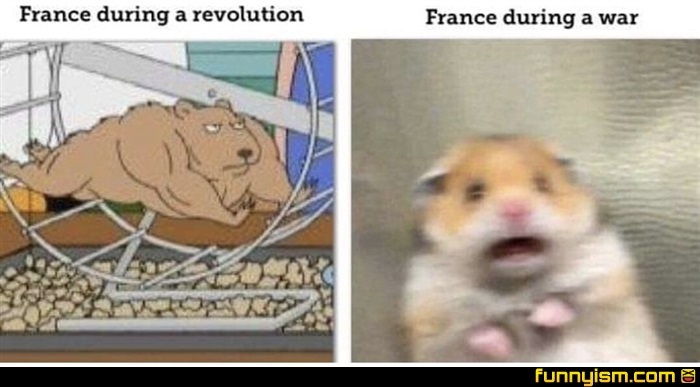 Yeah, but when France has a revolution, nobody wins.